We stipulated: I was in New York for some meetings, and met my pal Paul for dinner. 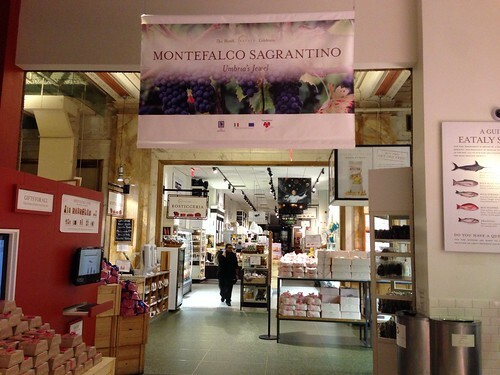 I'd walked around Eataly before but had never been able to eat there. I wanted to finally get the full Eataly experience. They stipulated: Eataly is an original “marketplace” model inviting consumers to be active participants in an innovative food and beverage experience where they shop, taste and savor high quality traditional Italian food products and beverages along with local produce and artisanal products; a multifunctional marketplace that includes a premier retail center for Italian delicacies and wine, a culinary educational center, and a diverse slate of seven boutique eateries. Each restaurant offers authentic Italian dishes with an emphasis on a particular type of food group. 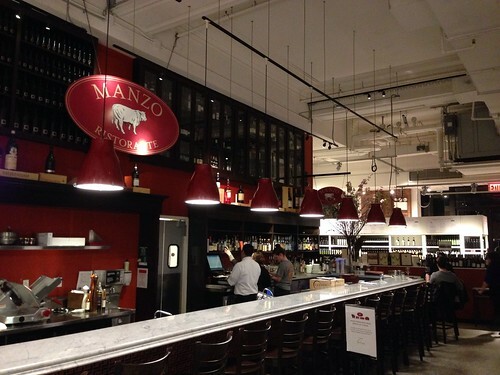 We wound up eating at Manzo: Manzo literally translates to "beef" and is Eataly’s more formal dining experience that celebrates meat from the United States. 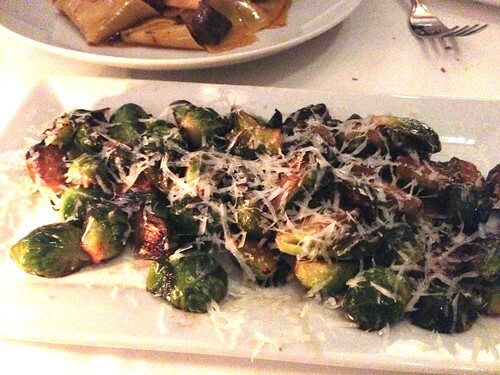 Manzo offers both modern Italian preparations as well as traditional Piemontese beef dishes. Our chef works like a true Italian butcher to use every part of the animal, tongue and cheek. 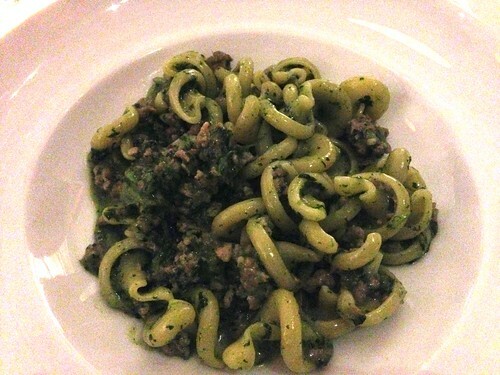 High point: I enjoyed my vesuvio pasta; the sausage and pesto mixed nicely and the pasta had a slight crunch. 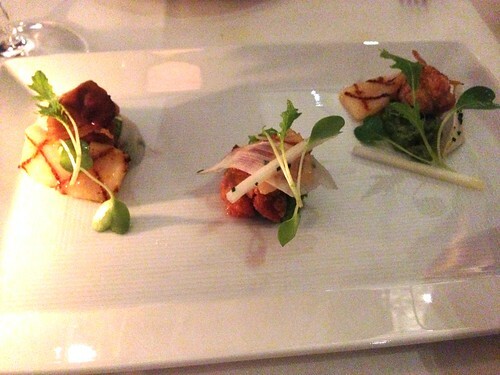 Low point: We weren't sure what to make of the veal sweetbreads appetizer; it was small and probably something we wouldn't order again. 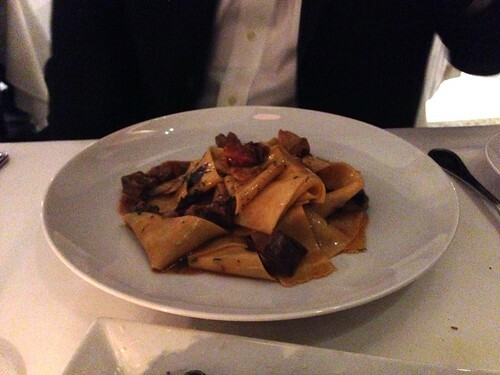 Overall impression: Eataly can be a bit overwhelming at first, and the initial restaurant we checked out had a long wait for a table -- which is why we wound up at Manzo. I enjoyed the experience, but didn't really need to do something quite so fancy. Will we return: Looking forward to trying different restaurant counters.